Convert your Calendar to Excel and Word format. 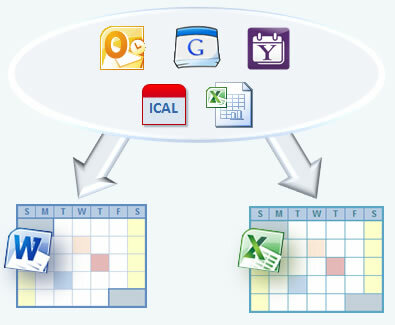 Easily import calendar data from a variety of sources into Word & Excel. WinCalendar supports importing data from: Outlook Calendar, Google Calendar,Yahoo Calendar, Excel Table,CSV and iCal/ics Calendar. In most cases importing is so easy that it is done from WinCalendar without having to Export your calendar first. See Calendar Maker Home for screen shots of samples & general info. WinCalendar as an Addin within both Microsoft Excel & Word (Windows only) and is fully menu driven. All Calendars are created in native Word (doc / docx) or Excel (xls / xlsx) format. From Word and Excel you can further edit like any MS Office document, add pictures, tweak formats and print using all the abundant features of Microsoft Office. Click here to download WinCalendar or for more info see the links on the left.